Ever feel like you’re surrounded by some personal perception filter? Well, Mr invisible, Captain Jack is here to save the day, and just dying (if he could) to sessify your look and Get. You. Noticed. (watch him with the tape measure though!) 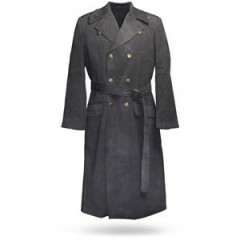 Introducing the Captain Jack Harkness Coat…a costume replica of his signature wardrobe piece. Officially licensed by the BBC and featuring a double-breasted closure, replica RAF brass buttons, an exact replica belt buckle, a back kick pleat and functional pockets inside and out, the Captain Jack Harkness Coat is cool to the core (and super warm for winter) letting you strut through the snow looking quite the man about town time. After all, winter is when everything changes. And you’ve got to be ready! Available in sizes S through XXL, the Captain Jack Harkness Coat is available now from ThinkGeek for $329.99.